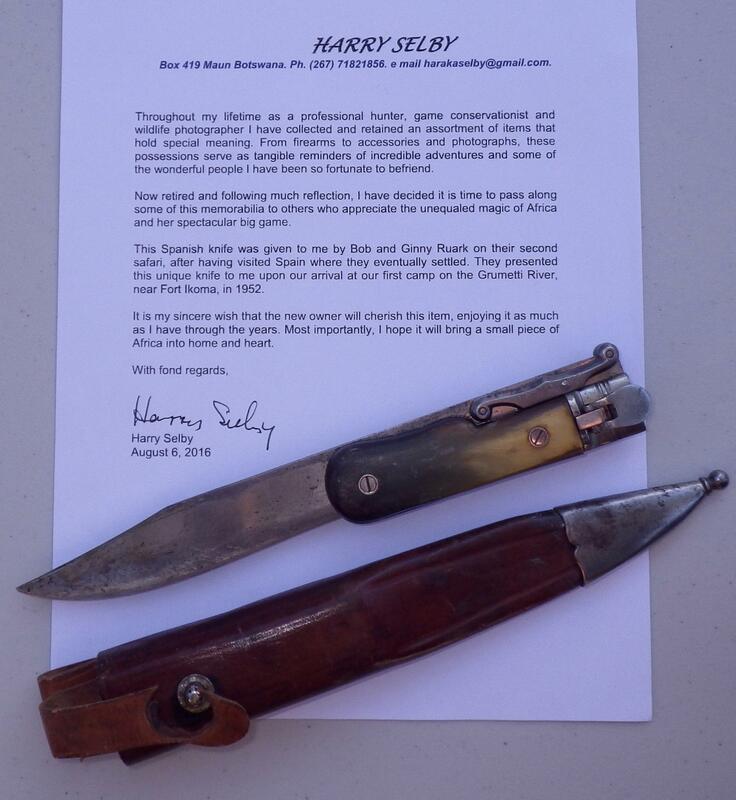 Robert Ruark to Harry Selby presentation knife, 1952, history letter signed by Selby - Sportsman's Legacy, Fine firearms, related books and sporting collectibles. Representing estates, collectors and nonprofit conservation organizations. Presented by Robert Ruark to Professional Hunter Harry Selby in 1952 at the beginning of their second safari together, this well-used Spanish knife is one of the most important and historical hunting artifacts ever offered to the public. Entrusted to Sportsman’s Legacy by Mr. Selby and supported with a letter bearing his original signature, holding this knife takes one back to old Africa and a time when a 100-pound elephant might be waiting at the end of a track, black rhino crashed through the thorns and the Mau Mau were growing restless. Equally important, it is a tangible connection to the men whose adventures together inspired some of the greatest works to be found in any hunter’s library. Selby showed Ruark his Africa and Ruark shared it with the rest of us in a way unequaled before or since. Selby also served as the inspiration for one of Ruark’s most memorable characters, Peter McKenzie in Something of Value. Even today, those who dream of Africa are the richer from their chance pairing of long ago.